Nestled in the leafy suburbs of Balwyn, you’ll find this quiet and unassuming but STELLAR Indian restaurant. I came with my family and dined like a king, opting for one of their banquet selections. And boy was I in for a treat! You see, I trained with the owner’s son, VR, in Kung Fu nearly two years ago and we became great friends over this time. One of the things he did mention was his parent’s restaurant and that he would love to see me visit him there. With my renewed vigor to “be a man of his word” (cause you’d be surprised how many people aren’t. Give it a little while and you’ll see what I mean from the people around you), I was going back and ensuring I kept all my promises to my friends that I have ever made (and can remember). And thus the amazing trip to this location was born. First of all, everything on their menu looks amazing, delicious and completely reasonable. A surprising change of pace for me, as I always expect a “premium” wherever I go. Or maybe it’s cause I eat in the city too often…. The first thing I noticed when I entered the place was the ambiance – the restaurant managed to recreate the feeling of a top-notch Indian dining experience. As we were served by VR, I thought that we might be getting the gold standard of service. But this was not the case. Everyone was treated with the same amount of service and attention to detail as we were. Even the slightly rowdy and happily tipsy older gentlemen were treated with courtesy and respect. Ok, ok. Now to the food. Prepare thyself. As we had chosen the King banquet at $26/pp, I had no idea what we were in for. I hope that these pictures will give you some clue. 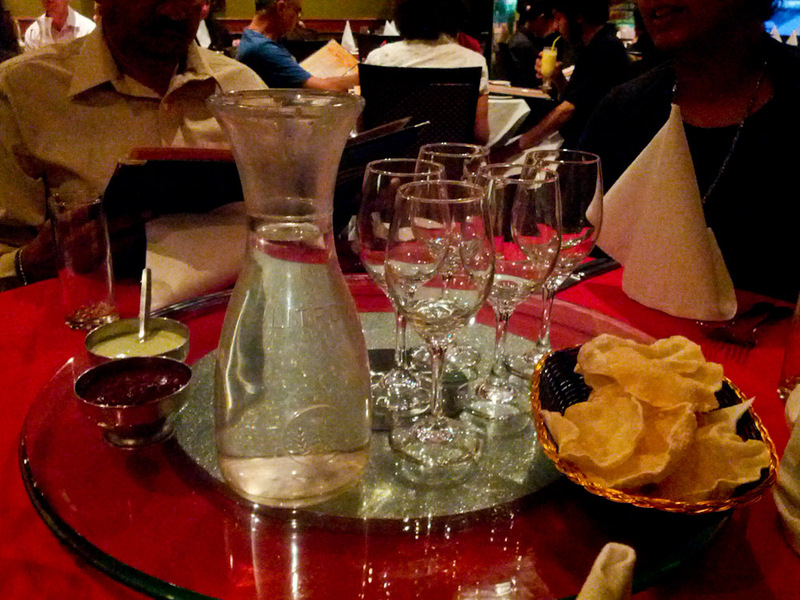 Everything started off with poppadums, samosas and dipping sauces. I would be lying if I said I didn’t want those dipping sauces all to myself. I have no idea what they were, one was sweet and had the taste of tamarind and the other was a yogurt thing. Of course, I couldn’t say the yogurt was better than the way my Dad makes it, until he exclaimed it (shortly after tasting it himself), that I quietly kept rotating the center table towards me all the time. Then came the samosas. And WOW. Just WOW. 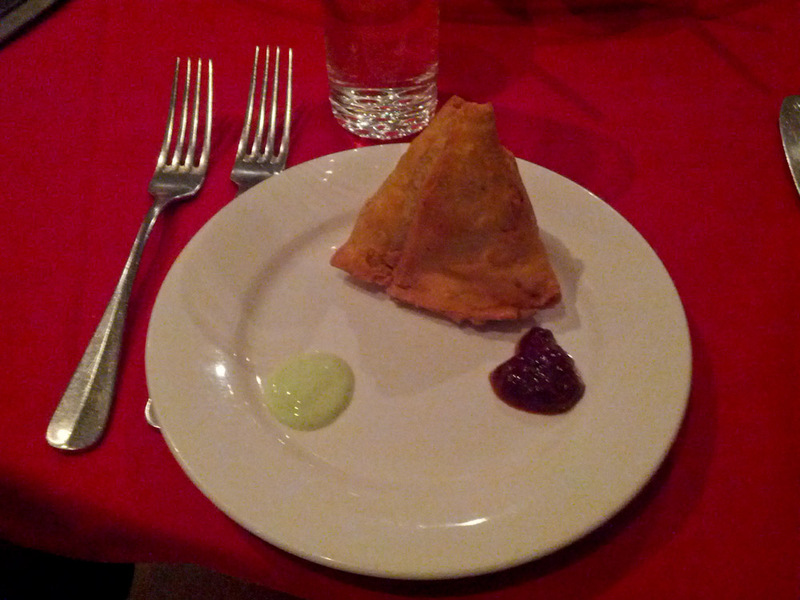 The ingredients within it was fresh and the samosas themselves looked completely hand made. The potato was fresh and steaming inside it and the flavours, oh man, the flavours. If I could eat only this, for the rest of my life…so be it. 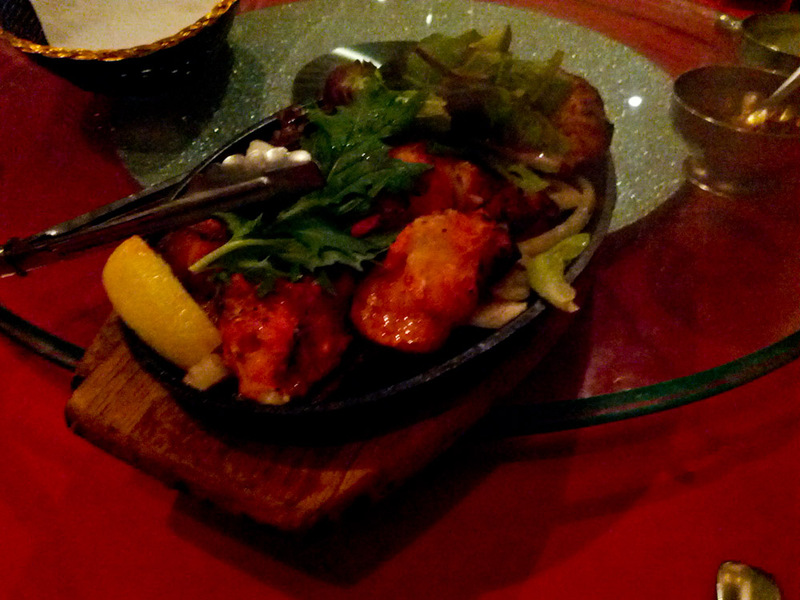 And at the same time we were presented with succulent fish and lamb. I have never tasted such amazing and well cooked fish like that in such a long time. I remember Mum used to cook that dish with similar spices when I was very young and tasting the fish immediately brought all those childhood memories flooding back! The lamb was as delicious and tender as if it had been slow cooked for hours. Then came the mains. Firstly, the plates themselves were hot. I’m pretty sure that it should come like this, and given that I have been served with hot plates in so many places that I assumed that this was ALWAYS meant to be the case. But alas no. So instead, I have now come to expect eating on cold plates. But when the empty plates were served hot…. I was suitably impressed. Upon the mains being served, to be honest, the size of the dishes left me feeling a little disappointed. I thought there would be more. BUT! That was a different story towards the end. When the meal was over, we were all BURSTING at the seams and there were tons and tons left over. Which, I couldn’t have…. (the whole wastage of food and such – yuck I hate to think how much food we waste as a country) so I managed to coax the males on the table to finish the meals. What was in there? Butter chicken, orange peas with rice (well there was a name, but I couldn’t remember), lamb rogan josh, garlic filled naan and roti. 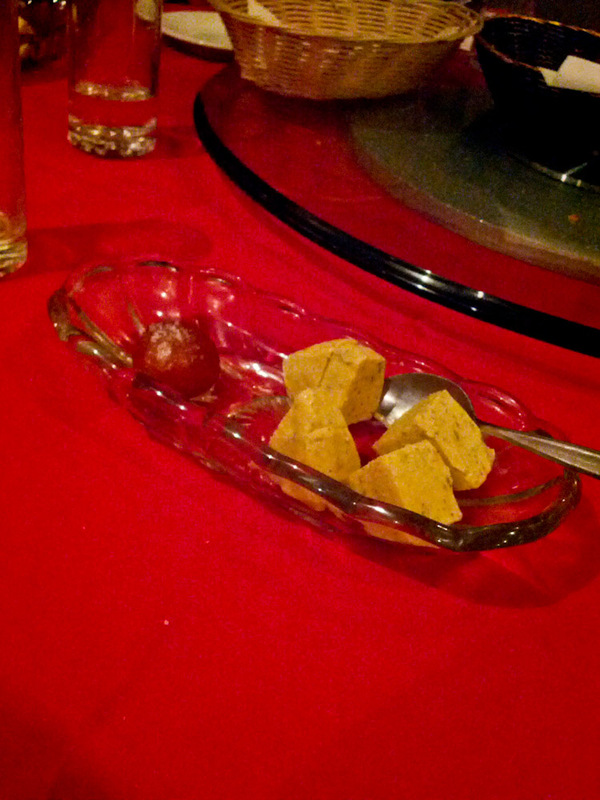 And finally, yes because there is a finally came the kulfi and gulab jamun. If you haven’t tasted these previously, you have no idea what you’re missing out on. Seriously. And if you don’t eat here, you are missing out on one of (if not THE best) gulab jamuns and kulfis you will ever have the opportunity of tasting. 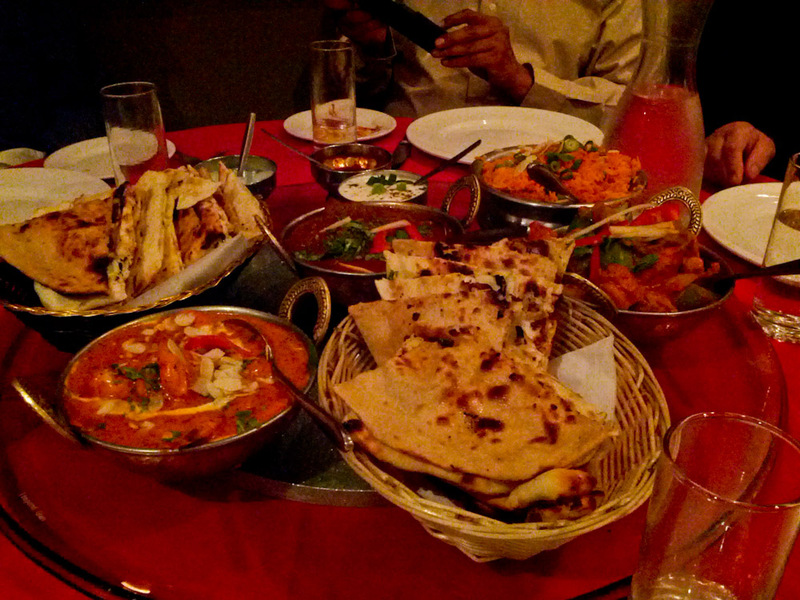 All in all, it was one of the best and most relaxed family dining experiences I have had in a long time. And at $26pp, it was also one of the most reasonable prices I’ve paid. Congratulations guys – you have set the benchmark for all the restaurants I review in terms of food quality, presentation, attentiveness of service and price. P.S. My family have now decided to make this one of our regular restaurants.